American actress Jennifer Garner, the heroine of the television series Alias? ?, will play a younger version of the famous female detective Miss Marple. After negotiations which lasted several months, Disney has managed to obtain the rights of using the stories of famous character that first appeared in a magazine in 1927. It’s not very easy for us to imagine how Jennifer Garner will enter into the character of this old girl. This will require a ton of makeup although it seems that The Mouse House deals in an innovative character, trying to assign it with a younger generation. Jane Marple is one of the most famous characters created by Agatha Christie, is a very good gaffer and knowledgeable of the dark side of human nature. The character first appeared on big screen in 1961, in “Murder, She Said”performed by Margaret Rutherford, who was 70 at the time and it repeated that role in three films. Angela Lansbury played the role in “The Mirror Crack’d” in 1980, a film based on an Agatha Christie novel and she dedicated this role to actress Margaret Rutherford. Agatha Mary Clarissa, Lady Mallowan, well known as Agatha Christie was a British novels writer who created short stories and plays. She also wrote romance novels under the pseudonym Mary Westmacott, less known, having the same success. Her works, mainly those that are the main characters Hercule Poirot or Miss Jane Marple made Agatha Christie to be called “Queen of Crime”, it is considered as one of the most important and innovative writers of the genre. Agatha Christie wrote 12 novels in which the main character is Miss Marple. Most of Agatha Christie’s books focuses on discovering the author of a crime who belong to middle and upper classes. American producers hope the modern approach and choice for the role of actress Jennifer Garner will be the next Miss Marple films with a franchise to rival series “Sherlock Holmes”produced by Warner Bros. studios. Jennifer Garner, became famous thanks to the role of the television series “Alias? ?” and we will be seen her this year on the big screen in comedy “Arthur”, produced by Warner Bros. studios. 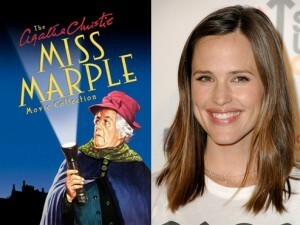 I love Miss Marple and I hope they will maintain in this new project with Jennifer Garner just a little bit of her character(Misses Marple).I also read some books of Agatha Christie and I liked very much what I read.